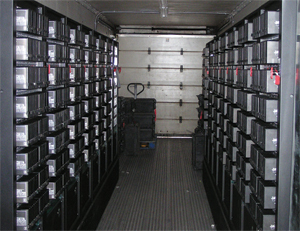 research institute in Menlo Park, CA, to design and produce a battery-service trailer (BST) capable of simultaneously charging 2048 lithium-ion batteries. The batteries are used to power portable instrumentation during National Guard field-training exercises. SRI then provided an empty 48-ft. refrigerated trailer to sheetmetal fabricator Airtronics Metal Products, in San Jose, CA, for modification and outfitting to house the batteries. The BST called for Airtronics to design, fabricate and install 16 special 19-in. equipment racks to house the charging units; fan-tray and fire-suppression systems; and HVAC and duct systems. Airtronics also designed and installed AC prime power distribution wiring, and fabricated and installed four weather-worthy cable containment boxes beneath the trailer, each box holding a 250-lb. power cable. Building the cabinets and racks came easy, as this is Airtronics’ core competency. The real challenges were designing and planning the electrical systems to allow powering the trailer from four separate external generators supplying a total of 150 kW, and balancing the airflow through each rack. The project required sophisticated problem solving to develop a bulk charging environment with special cooling and venting requirements, and emergency back-up electrical, lighting and power-distribution systems. Because uniform air flow and cooling around the chargers is essential to reliable operation, Airtronics built special air plenums and HVAC cooling ducts to maintain an equipment temperature of 35 C. It also developed and installed standard and emergency lighting systems along with all associated circuitry for the chargers, HVAC and system controls. See also: Airtronics Metal Products, Inc.